No matter what lifestyle you have, or the goals you are working towards, living a financially free life will open your world to possibilities. To achieve this, investing is mandatory. There are now so many investment options available to suit any taste, goal or risk profile, so it’s time to stop thinking and start doing. Investing is not a short-term game. If you are looking for a quick win, be prepared for a quick loss. The social researcher and author, Michael McQueen, says “Momentum = (Activity + Focus) x Consistency”. So, act to invest in a strategy that matches your goals and then follow it through. Purchasing equities through the sharemarket is generally a three-years-plus strategy, and realistically something you should be doing throughout your life. This is where real gains and long-term wealth come from. The market is volatile and your investment will probably decrease in value several times while you’re holding it, so you need to invest for several years to allow for recover and take you back into gain territory. 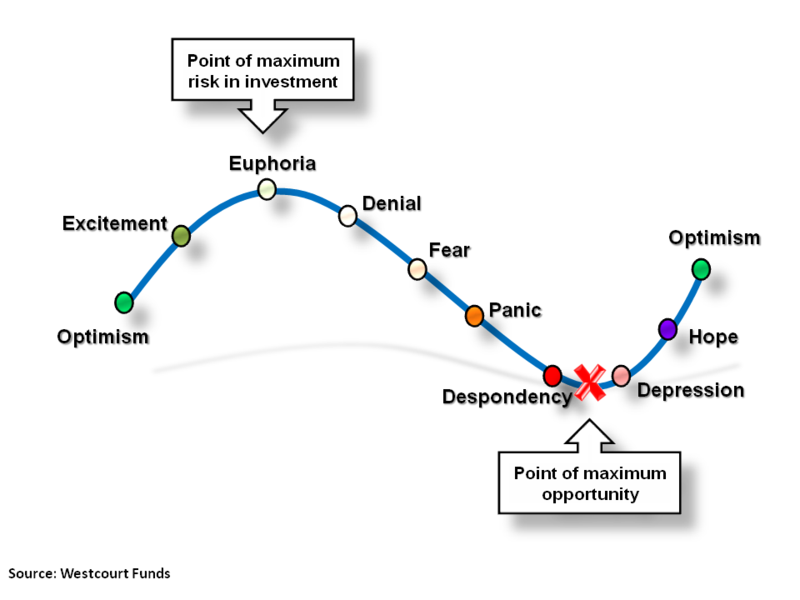 The image below shows the emotions investors tend to follow during investment cycles. When the market is down, it’s like a big stocktake sale and you can buy quality companies at a good price. But you need to be aware of this volatility and be connected to your overall strategy to ensure you don’t panic and sell too early. That’s when investing can hurt. There are always going to be times when the market is panicking (think Brexit, US elections, etc.) but if you are investing for the right reasons, these times will become periods of opportunity. Growing capital or generating income? There are two elements of financial returns for any investment – capital growth and income (yield). If you set your investments up to achieve a goal, you will know what you want. For most Gen-Y members I work with, investing is about growth. Income is important, but they want to be aggressively growing wealth now and possibly switch to a higher-yielding investment (and probably lower growth) later. It is very challenging to find an investment that is high growth and high yield. Take property, for example. You can buy in blue-chip suburbs with excellent potential for capital growth, but the rent (as a percentage of the property value) can be much lower. Alternatively, you can buy out in the suburbs where the capital growth may be lower, but you will achieve a higher rent. Both outcomes can be fantastic, if you know why you are investing in the first place. The “I’ll wait until I have more money” excuse has been blown apart. Financial technology has progressed to the point where transaction costs are reducing and easy access is increasing. Platforms such as Acorns will get you investing in ETFs (exchange-traded funds) from your first $5. SMA (separately managed account) platforms such as Praemium will support incremental investments (my favourite type) from $100 a month. And if you can start with $5,000, Clover.com.au will build you a personalised portfolio, including an option to include ethical investments. One of the biggest advantages of investing in the sharemarket, rather than in lumpier-style investments, such as property, is that you can gain access quickly and easily. Of course, having an initial investment to get things started is better, but not mandatory. Get started with what you have now and build on that. This is about selecting companies you would like to hold and buying direct shares via a stockbroker or broking platform. This can be a great way to learn about investing, but for people getting started it can be expensive to achieve diversification and puts a lot of pressure on you to make good selections. Consider direct buying with a small portion of your money and invest the bulk using one of the following options to spread the risk. This is a passive investment that tracks assets or a market index. The ETF will largely mirror the return of the underlying investments and is considered the lowest-cost way of gaining diversification in your portfolio. ETFs tend to have relatively low turnover within the index and therefore low transaction costs, and capital gains tax events are minimised. This is a rapidly growing area of investing and there are now ETFs available for many sectors and geographical regions. These are companies listed on ASX that own and manage underlying investments, trying to outperform a benchmark, such as the All Ords. The value of the LIC does not always match the value of the underlying funds; it can be higher or lower, and generally fees are higher compared to an ETF because the overlay of management costs. However, if the LIC is consistently outperforming the market, the higher fee might be worthwhile, so do your research. These are available through online platforms and commonly used by advisers. SMAs allow you to buy direct shares, LICs and/or ETFs. You can purchase these equities according to a model portfolio. This means you can enjoy the benefits of them, in a portfolio tailored to meet your needs. Keeping transaction costs low is key here to ensure you can continue to invest over time, rather than all at once. This initiative by ASX opened the market for investors to purchase unlisted managed funds, with relatively low transaction costs, and giving access to a huge range of asset classes that otherwise may not be available through listed investments. There is an exciting range of funds available if you are looking for something a bit different. There are pros and cons to all of the above investments, so it’s important to understand which might work best for you, considering your goals and personal circumstances. You might consider a combination of several, or you might start with one type and introduce others over time. It’s natural to think about returns, fees, risks and all costs, but the cost of not getting started will probably outweigh them all. Rebecca Boles is Gladiator (financial coach) at Wealth Enhancers, an award-winning Gen Y financial advisory firm. First-time Investors provides free information on getting started in the sharemarket. This article appeared in the March 2017 ASX Investor Update email newsletter. To subscribe to this newsletter please register with the MyASX section or visit the About MyASX page for past editions and more details. This article appeared in the March 2017 ASX Investor Update email newsletter. To subscribe to this newsletter please register with MyASX. This article appeared in the March 2017 ASX Investor Update email newsletter.